Ocean Pines is home to over 15,000 year round residents and is a quiet shore community that features 9 miles of waterfront property, fine dining, boutique shopping and association extras including, a golf course, five pools two Marianas and Ocean City’s premier Beach Club. 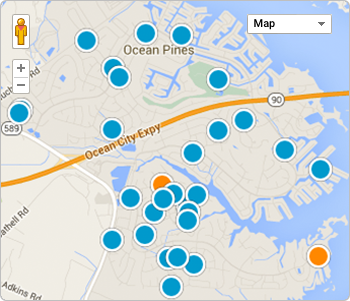 Living in Ocean Pines means you are in one of Maryland’s top 5 schools district. Ocean City is a short drive via bridge that connects Saint Martin's River and Assawoman Bay. Ocean Pines a perfect choice to buy your dream house. Ocean Pines homes are fairly new builds with most built within the past 20 years. You can choose from golf course homes and condos, luxury water front properties or even consider a positive equity investment property. Ocean Pines offers something for every buyer's budget and taste.